Other great Asian finger foods to try recipes to try! Skip the heavy dinner and plan an Asian Tapas Menu full of light offerings and flavorful dishes that are easy to make and will satisfy every taste bud! An appetizer menu is the best way to skip a heavy meal and still get a variety of offerings! When I first started eating tapas style, or grazing off multiple plates instead of eating one large entree, I gravitated toward more Asian-Inspired dishes. Asian cuisine is light, with bold flavors, and includes lots of fresh produce. It’s also quick to make and doesn’t involve a lot of complicated steps which is perfect for a busy night. Not only does it work for a family meal on a night where everyone is swamped but also as appetizers for a party! Whether you are having game night or binging on the latest TV series, these fun Asian Tapas Menu recipes are sure to please! Seared Tuna Steaks are one of my favorite Japanese appetizers. Fresh tuna, seared with a thin layer of nutty and crunchy sesame seeds, and served with a simple Ponzu dipping sauce, gets my mouth drooling just thinking about them. How could I not include them in the Asian Tapas Menu?!?! When cooking the seared tuna steaks, it’s important to have a screaming hot skillet. One that heats fast, evenly, and without any warping. Anolon’s Accolade 8″ Skillet is the perfect size for searing the tuna and the triple layer, nonstick surface is safe for use with my metal spatula to make sure the sesame seed crust doesn’t get scraped off when flipping the steaks. Just dry the surface of your tuna, brush lightly with olive oil, and press into sesame seeds. Sear each side for only 2-3 minutes and you are ready to eat. The best way to serve the tuna is rare and still pink in the middle! Just take me to the Asian Tapas Recipes Already! If you’d rather skip my (very helpful, I think) tips and tricks, essential cooking info, and similar recipe ideas – and get straight to this delicious easy Asian Appetizer Recipes – simply scroll to the bottom of the page where you can find the printable recipe card. Another great appetizer to make is lettuce wraps! Customizable with so many different filling options, they help you get your green leafy vegetables in by making lettuce the vehicle for eating! I chose chicken for this menu because just about everyone I know likes chicken. For the vegetarian or vegans with you, it is easy to leave the chicken out of the mix! Plus you can use your favorite sauce that you have on hand and doesn’t require any unusual crazy ingredients. This is supposed to be easy, right?!?! This post may contain affiliate links.I earn a small commission for my endorsement, recommendation, testimonial, and/or link to any products or services from this website.Your purchase helps support this blog at no additional cost to you and allows me to continue bringing you delicious recipes and funny stories.For my entire disclosure policy . I start these lettuce wraps by searing the chicken in the Anolon Accolate 12″ covered deep skillet. The durable nonstick surface gives the chicken a crispy seared outside while keeping the chicken juicy on the inside. After I sear the chicken I remove it from the pan and then cook the veggies. Once the vegetables are tender, add the chicken back into the pan along with the sauce. After a quick toss to see everything is combined, I can keep the filling warm in the oven. Just cover the pan and the lettuce wrap filling is ready when you are. When looking at a sweet way to round out the Asian Tapas Menu, I knew I wanted to incorporate matcha, or green tea, along with some Chai spice. Green tea is generally used in Japanese tea ceremonies and not in Chinese dessert recipes, but know it works well with the rest of the dishes. Being that it’s an easy menu to make, dessert shouldn’t be any different. Grab your trusty puff pastry and let’s make some Matcha Chai Palmiers. Buttery, flaky cookies with fragrant spices are the perfect bite! Palmiers are crispy cookies made from puff pastry with a simple cinnamon sugar coating but these are kicked up a notch with a Matcha Chai cream cheese filling. They take 5 minutes or less to put together and can bake while you are making the lettuce wrap filling! I love the Anolon Allure Cookie Sheet for making these Palmiers because the nonstick characteristics make it so you don’t require parchment paper or nonstick spray! Follow Anolon on social media to get even more recipe inspiration and see all of Anolon’s amazing products. Whether it’s a weeknight dinner or a weekend gathering, food is what brings us together to create memories and stay connected with those we care about. Not fussing over complicated cooking gadgets, labor-intensive recipe instructions, and certainly not doing the dishes afterward. Thank goodness Anolon’s cookware is safe for the oven so I can keep my food warm until I am ready to serve and when I’m done, can be placed in the dishwasher along with all the plates and forks for an easy cleanup! Are you drooling over these gorgeous pans? You can absolutely win a set of your own! is giving away the very same set that I am using to make this Asian Tapas Menu to 5 lucky winners. Hop on over and enter to win a set. You must be 18 or over to enter. Good luck! Instagram, , , and ! If you love these Asian Tapas Menu Recipes as much as I do, please write a five-star review in the comment section below (or on Pinterest with the “tried it” button – you can now add pictures into reviews, too! ), and be sure to help me share on facebook! Dry the tuna steaks with paper towels. Brush the tuna steaks with olive oil. Place the sesame seeds on a flat plate. Press the tuna steaks into the sesame seeds to coat the sides. Sear the tuna in the pan for 2-3 minutes on each side. Remove the tuna steaks to a plate until ready to serve. When ready to serve, slice thin and serve with Ponzu and wasabi. In a bowl, combine the cream cheese, soy sauce, Chai spice, and matcha green tea powder. Unfold each sheet of puff pastry. Spread 1/2 the cream cheese mixture on the puff pastry. Fold the sides in twice to the center. Repeat with second puff pastry sheet. Chill for 15 minutes before slicing. When ready to bake, slice the Palmier rolls in 1/2 inch sections. Place cut side up on baking sheet. Bake for 10 minutes on one side, flip, and bake for another 5 minutes. When done, remove to cooling rack. Repeat with remainder of palmiers. In a zip-top bag, combine chicken and cornstarch. Mix to coat the chicken. Let sit while you are preparing vegetables. Slice the peppers and onions to your liking. In a small bowl, combine the sweet chili sauce and pineapple preserves. Heat the skillet to high. 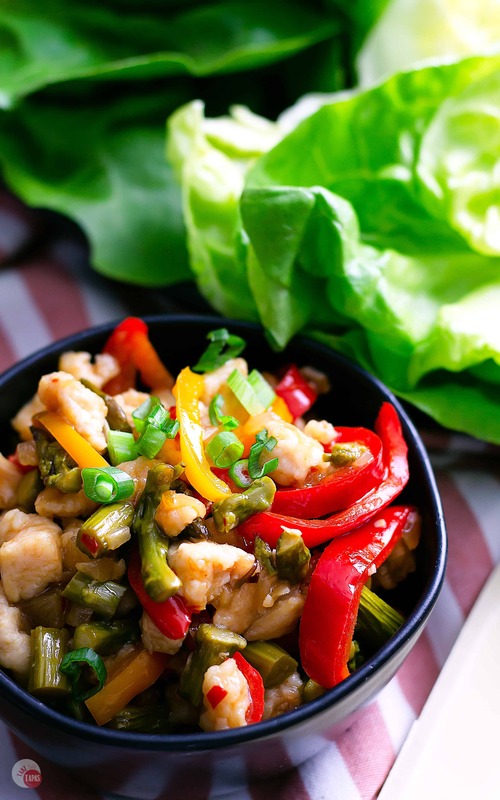 Cook the diced chicken, stirring frequently, until crispy and the chicken is cooked. In the skillet, add the vegetables and cook until tender. Add the chicken back to the skillet. Pour in sweet chili pineapple sauce. Serve the tuna steaks with Ponzu sauce. Wash lettuce leaves and dry. Serve with chicken and vegetable filling. Serve Palmiers along with lettuce wraps and tuna steaks. *If you like this recipe, please leave me a comment and rate it with some stars.Thank you! ©. Content and photographs are copyright protected. Sharing of this recipe is both encouraged and appreciated. Copying and/or pasting full recipes to any social media is strictly prohibited.